#100 posts equals a $100 giveaway!! Oh wait... you might be saying to yourself - I already knew that! If so, you're right; in celebration of my 100th post on August 23 I kicked off a fabulous $100 giveaway to the Fahrenheit 350° Confectionery. If you didn't already know that, isn't that some great news?! Today was slotted to be the final day to enter, but Jodi, from Simply this and that, and I bumped into each other (in a proverbial sense of course) and she has some exciting things going on over at her blog! She is moving over to Pleasant-Home! and is having a welcoming party! She invited, and well, I just couldn't say no! How could I? Jodi is fabulous! Her welcoming party is replete with a week long celebration of giveaways, and new goodies daily! So..., I am extending the deadline for the giveaway by four days; now the absolute the last day to enter is September 4! 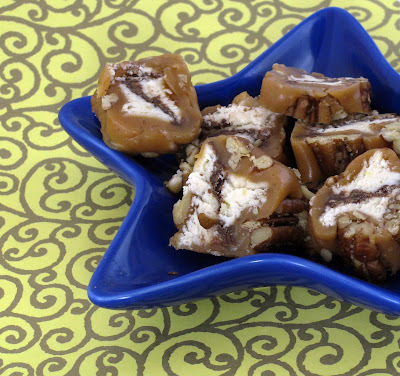 All you have to do is become a dessert guest! tell us how fab Jodi is! And now... you have one more chance to win-head over right now to Jodi's blog and leave a comment on her gorgeous new website for a chance to win not only my giveaway, but a whole host of others, starting today with an incredible Glamorous Girly Giveaway from my sister Pamela at French Knots! She is giving away a beautiful jewelry pendant, 2 yards of specialized fabric, a Lone Star Quilt wall hanging, and Barbie paraphernalia, worth over $200! It's the Sisters That Rock Giveaway! And just for changing the dates of the giveaway, I'm upping the ante! In addition to the lucky winner who will win a $100 gift certificate to the Fahrenheit 350° Confectionery, one additional person will win a ½ pound sweet log of their choice courtesy of Jodi, and rather than only 10 lucky winners getting a sample - I am upping it to 15! 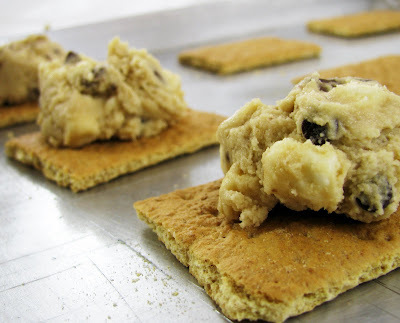 I named this blog and my confectionery after my favorite book: Fahrenheit 451°, and my love of reading... but lately I haven't been able to pursue that love as frequently as I would like. I need glasses - just reading glasses, but glasses none the less. The optometrist told me approximately 11 years ago that I would be fine so long as I didn't read for prolonged periods of time. That prescription worked for about 10 years and 11 months, give or take. Now however, it's virtually impossible to read a book without straining or feeling like I'm peering through a kaleidoscope. It's time to head back to the optometrist - I think an adorable pair of cat-eye glasses would suit me well! What do you think? And with a pair of new glasses, I would be able to read my new book: Secrets of the Fahrenheit 350° Kitchen! Yes indeed, my own book! I just wrote, organized and ordered my new book from Cherish|BOUND. This organization provides an incredible avenue for story telling by magically transferring your story to words, complete with templates, font choices, and your photos, in an easy online process to provide you with a hardbound, glossy book you and your family can enjoy forever. Cherish|BOUND's philosophy is to create a story teller out of us all, and that is just what their program allows you to do: Tell your story. They are also a proud sponsor of the Timpanogos Storytelling Festival coming up this weekend: September 3-5, 2009 at the Mt. Timpanogos Park in Orem, Utah. This is an event you don't want to miss! I will be there alll weekend, listening to stories, watching puppet shows, and grooving to music! Click below to learn more! My darling, darling! 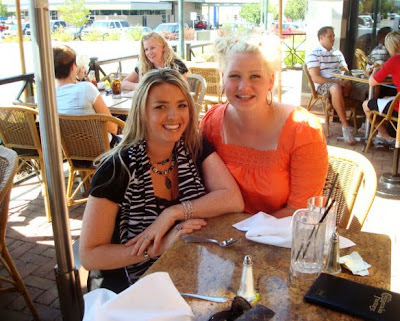 friend Heather came to visit me a few days ago. Well, she didn't exactly come to visit me solely per se.... but a girl can pretend! Spurred by her visit I've added a new section to my blog linking to all my favorite girls. It requires the coining of a new brilliant phrase: Bl*isters. 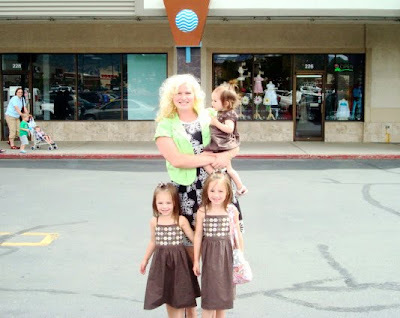 Blog + *Kiss + Sisters = Blog Sisters = Bl*isters! Use it, share it, pay it forward and spread the love! And check out all my favorite links, of course the list will be ever growing! Heather and I met through our husbands, and up until a few days ago we had never spent any time together alone, separate from our male counterparts. 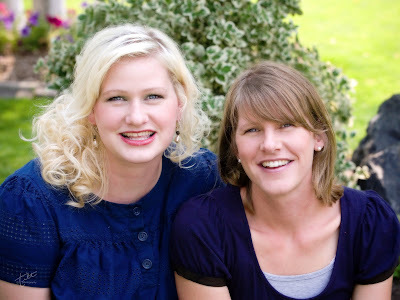 Gabriel met her husband, Kirk, on his LDS mission; although they were never companions in the mission, they met in the MTC and were roommates at one point during the two years. I met Heather initially at Gabriel and I's engagement party, and between our move to Oregon and their move to Oklahoma, our relationship has only existed purely by telephone and email - but Heather and I have became fast friends. Heather is totally my BFF! I love her dearly! She and I relate on a level completely transparent of whatever may be happening in our lives or in the world around us. She is the most gorgeous girl I know, both physically and emotionally; she is caring and devoted to whomever has her attention; she is unapologetic about who she is, but equally considerate of everyone else, in fact I've never seen her put herself first no matter what the situation; and she is incredibly talented and creative and adorable. We have the same opinions about child rearing, medicine, religion, food, exercise, friendship and everything else under the sun! 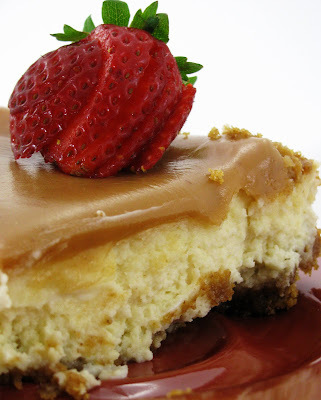 One of the fun activities we got to do while she was here was eat lunch at the Cheesecake Factory - and so it seemed appropriate to make a cheesecake in her honor. ...And don't forget to enter my giveaway! Being that all I seem to talk about is traveling, not my travels (of which there are none to speak of) - but the hope for future world adventures, one would assume that this month's Daring Baker's challenge would be one I would be grinning about from ear to ear... but, I just couldn't seem to muster up the energy to tackle it. I was relieved when I saw someone else post a parallel sentiment on the DB forums, however, it isn't called the Daring Bakers for nothing, so finally yesterday I set to work. I believe Heavenly Father created chickens solely for the purpose of baking cakes. The transformative possibilities that can be created from a simple egg are vast, and the differences between the two components-egg and yolk-are far reaching. This cake employs the best of both-egg and yolk-through the whipping process, and the decorative elements are just extra icing (pun intended). Despite my valiant stubbornness in making this cake and procrastinating until the last minute, it does taste fabulous! 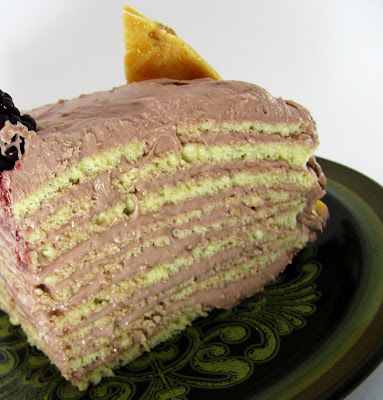 The textures are pleasing, the addition of blackberry is berry sweet and perfect, and it's a showoff, but... I still don't know how I feel about it. Tonight we remembered Michael's birthday, he would have been 34 this year. 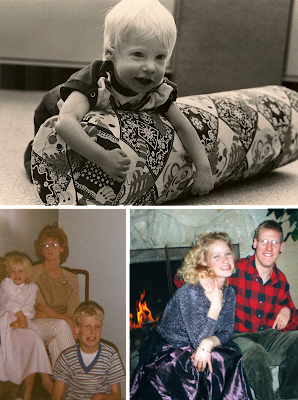 It was sweet and simple; just me, Pamela, Jill and our families celebrating life, and one whom we loved so much. 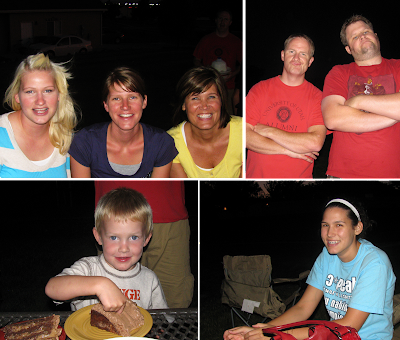 We spent the evening at the park and ate German Chocolate Cake-it was Michael's favorite, and he would have loved it. Of course we sang Happy Birthday; I'm sure it made him laugh hearing us sing off key. 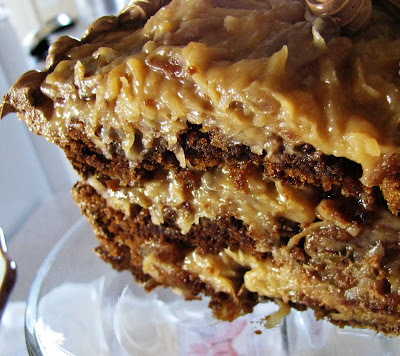 Growing up we always had German Chocolate Cake, if for no other reason then it was the best cake in the whole world. No one ever requested anything different, nor did we expect anything else on our special day. It was the only cake we ever wanted. 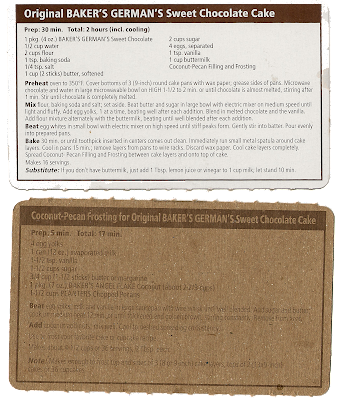 I only remember one birthday in which we didn't eat German Chocolate Cake! It was my 18th birthday and instead we had a Ghiradelli cake. 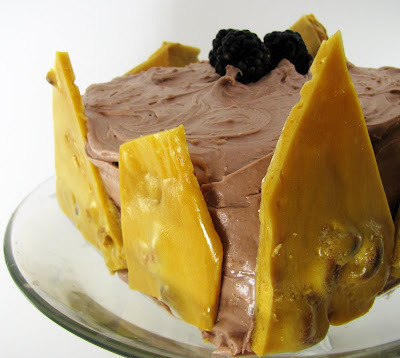 It was beautiful chocolate cake with chocolate frosting and solid chocolate wedges on top, but Michael and I snubbed our noses at it because it wasn't the traditional German Chocolate Cake! No one makes German Chocolate Cake like my mother,... except maybe me - and only because she taught me. She even cut it a special way, in half, and then sideways along the edge horizontally, creating what we dubbed: the edge piece. It was the piece with the most gravel and frosting, and was always bestowed upon the birthday child. I can't wait to start this tradition with our own children. 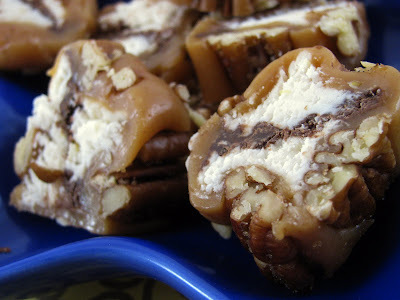 is what makes up the new Sweet Log: Lë mon. This sweet log is a perfect combination of sweet and sour. For sale now at Fahrenheit 350°! All this has been in preparation for my 100th blog post! 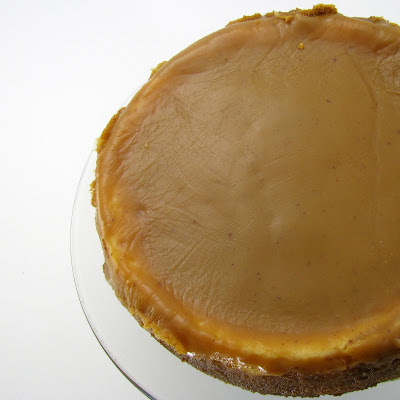 Since initiating this blog last November, I've shared with you 100 recipes. 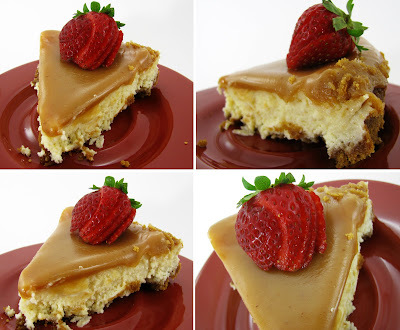 100 blog posts equals 9 holidays, 52 toppings, 6 giveaways, and 41 dessert guests. 100 posts equals a $100 giveaway!!! any item(s) found within my repertoire! use it all up, or hold on to it as new products become available! you will be automatically entered. about the new web page! And earn a third entry by blogging about this event. with a directing url to your blog post! 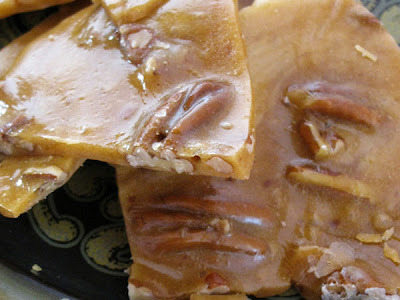 free Pecan Sweet Log Sample! 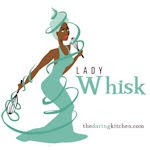 Gabriel, Master and Commander of the interwebs, has willingly, courageously and impressively transformed my website and blog, and is responsible for all the darling artwork and design! 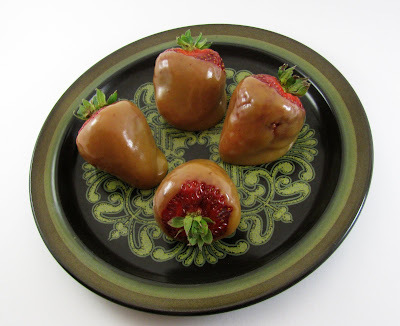 Picking strawberries was a childhood right in my home, and not one summer passed where the six of us weren't squatting kneehigh in berry bushes. It may very well have been the one assignment we never complained about. I loved sneaking berries, just to make sure they were ripe of course, in between filling up crates. I was always impressed at how many crates my dad could stack as he carried them over to be weighed. 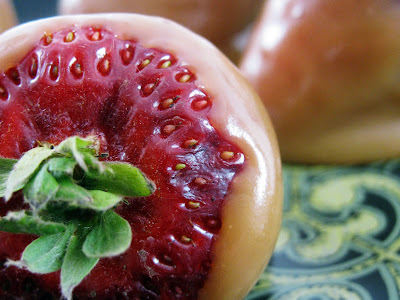 Then watching my mother pour them into the sink to be washed, stemmed and sliced for food storage, jam, or our favorite-strawberries and cream, was magical. Such a simple, yet beautiful berry, always brings out the best in me. I have to admit, my one regret was never sharing this celebrated experience with Gabriel. We went picking blackberries and raspberries, but somehow amidst dreaming about endless red dotted fields, we never went. I did however have a strawberry patch of my own at one of our nine homes over the years. It thrived, and it was one of my proudest accomplishments having never successfully found my green thumb before then. I cried, literally, when at the end of one summer I painstaking uprooted my entire strawberry garden when we moved to downtown Portland. I found a place for my new patch, but there was not enough sun, and the building was scheduled to be painted; needless to say, they did not survive. 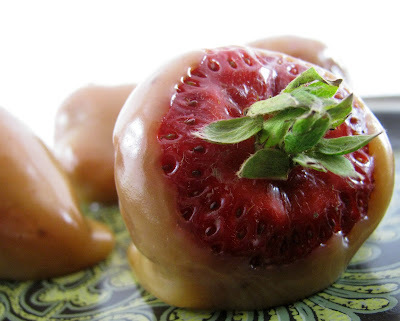 You've likely dipped your strawberries this season in chocolate, and maybe even marshmallow crème, but what about caramel? 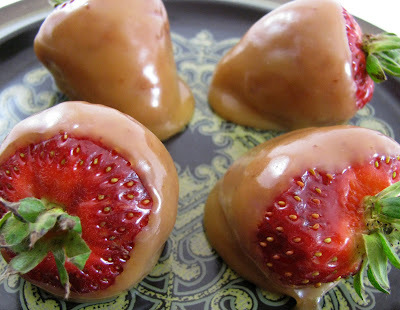 What will you do with the last available strawberries of this summers crop? 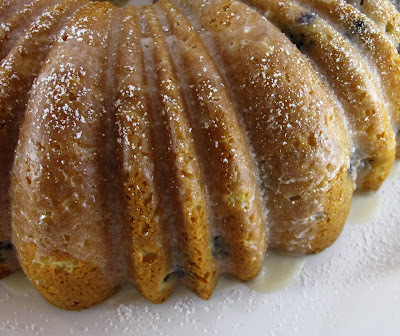 Ever since I saw The Kitchen Sink Recipes' Lemon Blueberry Bundt Cake - I had to have it. I had to have it in the worst way possible,... but, the last encounter I had with a bundt cake pan ended with decimated cake wallpapering my kitchen. 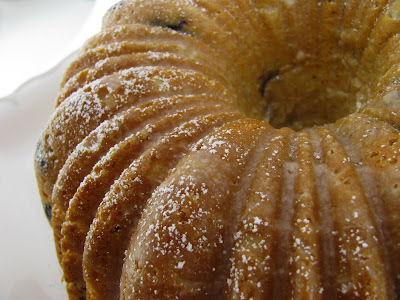 I toiled over how to make this cake outside of a bundt pan, and if a non-bundt version would placate my yearning for it. 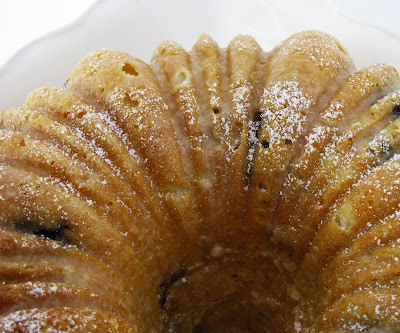 Eventually, I purchased the ingredients I didn't have on hand and resigned myself to the unfortunate necessity, only to realize that because of my last fisticuffs with the bundt, it didn't make the one way trip with the family to Utah. So I began to think what else could satiate my craving, when I found a gleaming $10 bill in my wallet! That was all the overwhelming confirmation I needed that the cake had to be made, and it had to be made in a bundt pan. I didn't even question whether or not Ross would have a bundt cake pan for $9.99, I just knew they would; and they did. 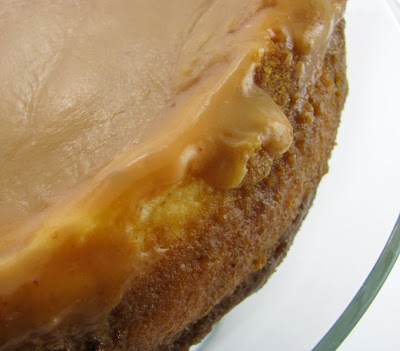 In terms of texture and palatability this cake certainly doesn't require a glaze, but if you feel so inclined, it truly adds to the overall beauty and presentation. This delicious cake was worth the travail. 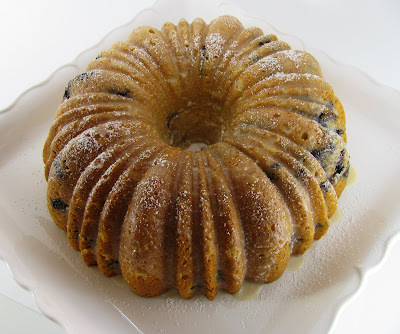 It is thick, moist, and creamy all at the same time, while the blueberries burst with flavor and tart apprehension. It has a crumbly outer crust and blends beautifully together with adroit exactness. My only advice: If you feel compelled to make this cake, do not hesitate. In Oregon, the only month in which you can depend on good weather, is the month of August. Weddings, camping trips, hikes and outdoor adventures always fill up the month of August in Oregon. And, while the rest of the country is busy starting school, Oregon prolongs the start of school until September - allowing it's students to fully enjoy a true summer vacation. 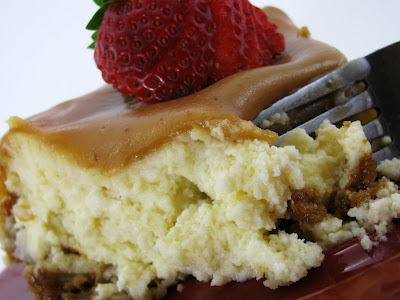 I'm a little behind on this month's Recipe Swap... between celebrating our anniversary at Bryce Canyon over the 1st, and participating in Mindy Mae's Market the following weekend. 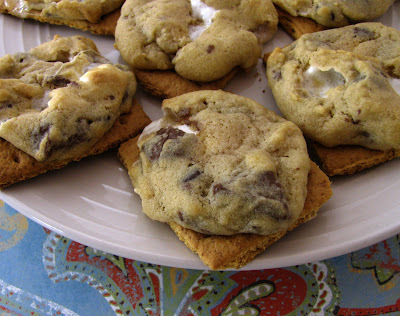 It would have been perfect to have published this post on National S'more Day, August 10! but I'm just not that with it! But, I can promise that the wait was more than worth it - keep reading! The weather is the sole inspiration for this month's recipe swap, since many activities and most schedules in Oregon are dependent on the weather, though really, we just learn to do and love doing, everything in the rain. However, toasting marshmallows over an open fire pit is downright impossible in torrential downpour. 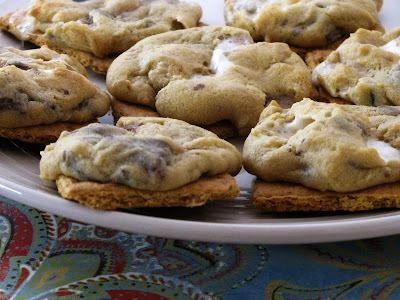 Plus, since we don't get all that much sun anyway, we have to improvise to get our fill; so this month's recipe swap is all about s'mores! I have to say it again, I love S'mores; likely more than anyone to have ever walked on this green earth, dead or alive: yep that much! Melissa was inspired to create her own s'mores tart recipe one evening while basking in the evening firelight of a campfire. In my opinion, that is always when the best recipes are envisioned. Hannah not only shared this incredible concoction with us, but she also shared her newest vegan marshmallow find as well! 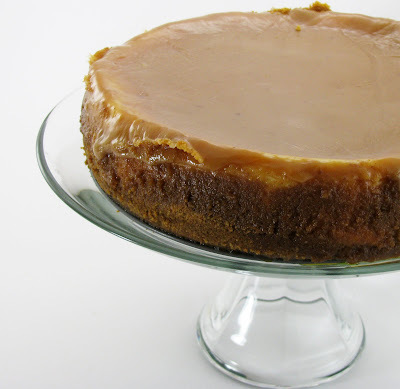 Unfortunately, there is no recipe to accompany this blog, but I think the idea is fairly straightforward. 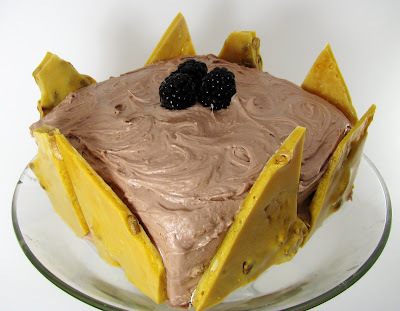 I learned what a "food blog" was for the first time when I met the 'Evil Cake Lady' at a cake bakeoff. Don't pay any attention to the cake I brought, it was my first attempt at a square cake, (and mind you I didn't have a square cake pan at the time) but do spend a few moments ooogling her S'mores Cake! 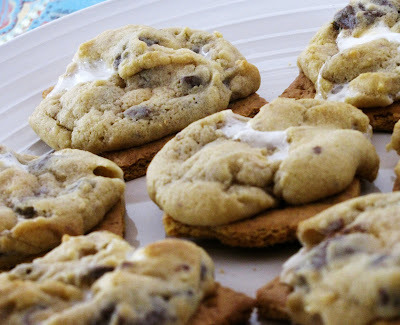 These cookies truly are the best of both worlds; they are chewy like a cookie and crunchy like a s'more. 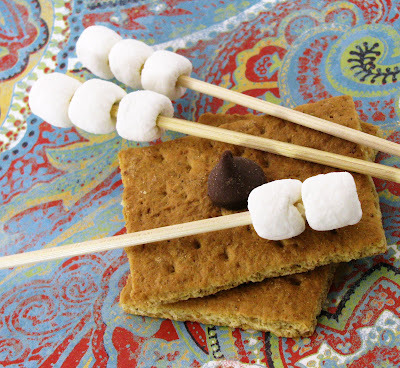 However, unlike true s'mores you don't have to have great weather or a fire pit-all you need are s'more ingredients! 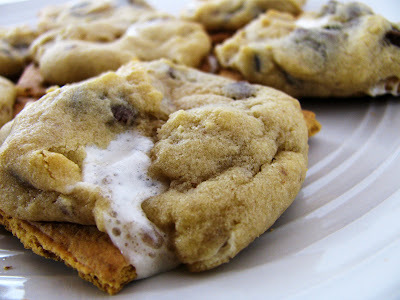 The most fun part about these cookies is that you actually bake the cookie on top of a whole graham cracker. Now, it is your turn! 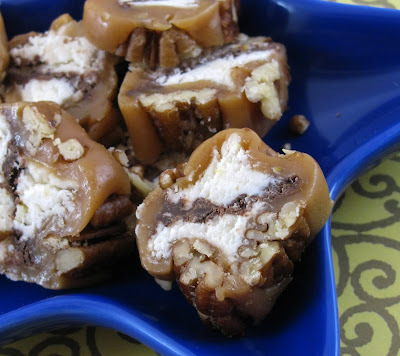 Share your favorite S'more recipes for the month of August, and be sure to include a link! 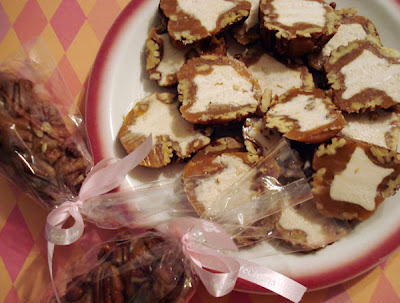 I will pick a recipe at random(.org), and highlight it on my blog! 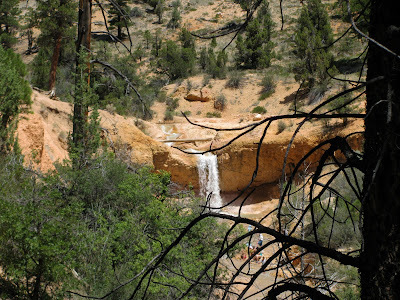 Two weekends ago, Gabriel booked a cute little motel on Main Street in Panguitch, Utah and we spent our 7 year wedding anniversary in Bryce Canyon. We love to celebrate any occasion, and find no better reason to celebrate then the day we got married! We have a tradition of always planning an adventure when August 1st marks the calendar. One year we were rained out on our camping adventure to Mt. Hebo, (we owned a leaky tent) so we brought the party indoors to a vacant apartment in our complex. We set up our sleeping bags and roasted marshmallows over our camping stove. Sadly, we didn't have a working camera that year, but trust me, it was a fun unique anniversary. Panguitch is a cute, little, lesser known town about 20 miles outside of the Canyon. 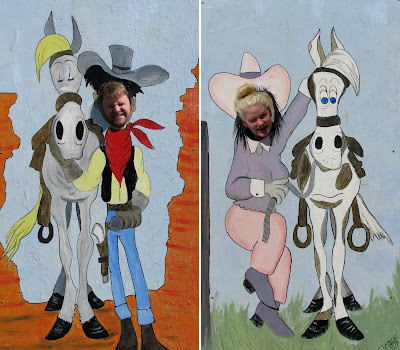 The town is riddled with wood cutouts of horses and cowboys/girls, so naturally, we couldn't resist. 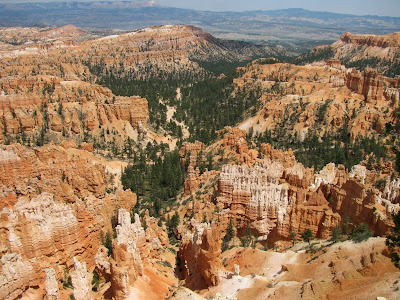 Bryce Canyon is breathtaking! 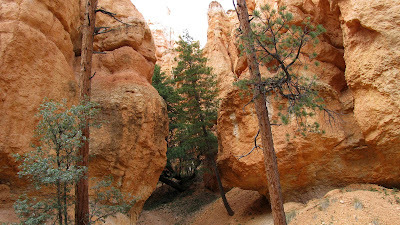 We were able to hike down into the canyon, where you see the grouping of trees in the above picture, along the Navajo Loop. 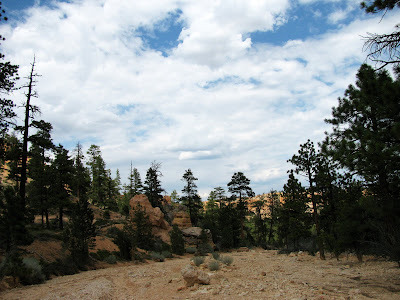 We also hiked along the rim of the canyon, up to Inspiration Point where we were able to witness a panoramic view of the hoodoos from a birds eye perspective. 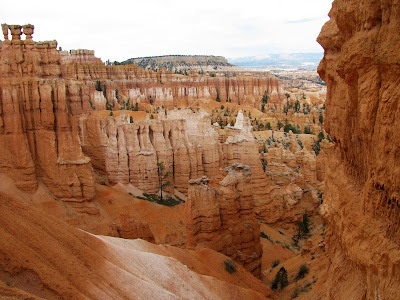 And on Fairyland Loop, we hiked eye level with the hoodoos and perched ourselves atop them staring down the chasms and fissures below us. 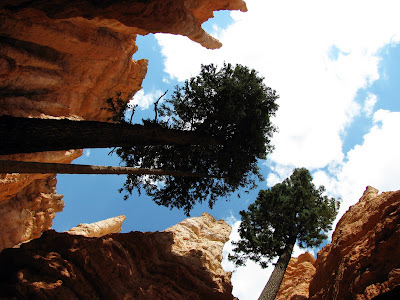 It was at Bryce Canyon where the infamous camera incident happened. We were hiking up to the Mossy Cave. We had made it across the waterfall and over the embankment, and we were just a few steps from safety when I tripped-spilling the camera out of the bag and watching, mouth agape, hearing Gabriel gasp in slow motion, as the camera tumbled, rolling down the rocky hill and into the water becoming completely submerged, as more water rushed around and likely through it. If this happens to you: Immediately remove the batteries and SD memory card; there will also be a small backup battery, remove that as well. Unfasten any opening, such as, flash, battery case, lens, etc. Shake any remaining water loose, and leave the camera resting lens up-you want all water to drain away from the lens. If you are at home, use a hair dryer periodically for the next few days, to blow air into the camera to flush out any remaining water. By doing this, you are giving your camera a remote chance of surviving this untimely disaster. Our only option was to do the above, and hope the hot dessert air and baking temperatures in the car would help the water evaporate. When we arrived home much later that evening, we put the SD card in rice, and began with the hair dryer technique. Two days later we felt safe enough to replace the batteries and have a go at turning it on... success. Despite this incident we had a wonderful time. 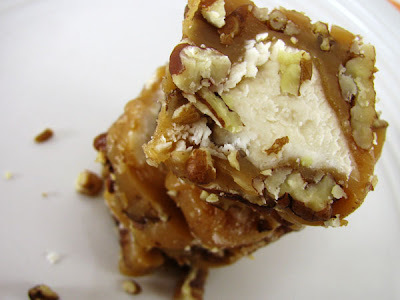 This ice cream is reminiscent of butter pecan, but with the addition of pieces of sweet log with rich candy fondant and buttery caramel, it is creamy, soothing and so very tasty. I made this ice cream whilst my camera was drying out-and no I couldn't save any until my camera started working!